A proactive approach provides good defense against potential problems. How do you choose the changes to make in your cropping program for the next season? Del Unger and his son, Lance, say identifying the most limiting factor and focusing on it is what works for their operation. 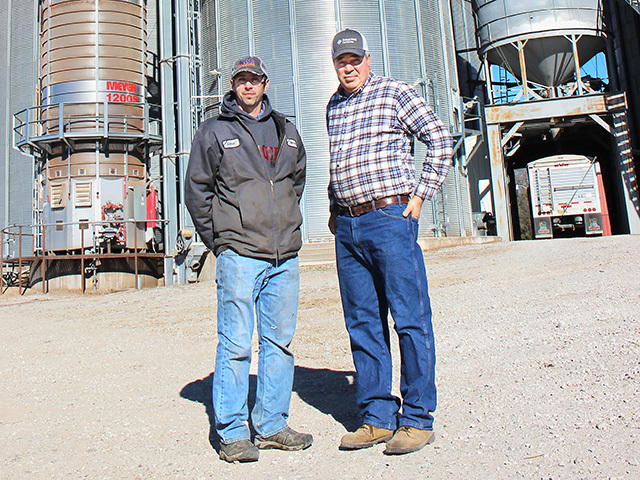 That strategy helped them reach their best corn yields ever in 2017–a 230 bushel per acre average with one field averaging 296 bushels per acre. So what's the most limiting factor to higher yields on the Unger farm? Micronutrients, say the Ungers. And so micronutrients top the list of five on-farm field tests the Ungers will be running this 2018 crop season. "Micronutrients may not be a big concern if you're farming deep prairie soils," says Lance. "But here in the Wabash Valley in southwest Indiana we've got everything from beach sand to heavy clays." For 2018 the Ungers will be running side-by-side strips in both corn and soybeans to compare different micronutrients and micronutrient combinations. Micronutrients to be evaluated include boron, sulfur, manganese and zinc. In corn the focus will be on boron. Sandy soils are notorious for being deficient in boron, which plays an important role in reproduction helping with pollination, silking and kernel development. "We had some tip back problems last year," notes Del. "If adding boron will help us retain six, eight or 10 kernels at the end of the ear, that's real bushels." The soybean test will compare several micronutrients and micronutrient combinations applied side-by-side. "We had good luck last year with a combination product that contained boron, manganese and zinc," says Lance. "For 2018 we'll try that combination product again and compare it with a boron and zinc combination product, and we may also try some other products as well." The micronutrients will be applied at R3 with the first fungicide application. "This should be a good test to help Del and Lance identify the micronutrients that pay for themselves in their soils," says Melanie Burk, area BASF Innovation Specialist. While Del and Lance are pleased with their nitrogen, P and K fertility program, they plan to tweak how they place starter this coming spring. "We've been applying corn starter fertilizer 2-by-2 (two inches over and two inches down from each corn row)," says Lance. "For this coming year we're going to plant 2-by-2-by-2 on each side of each row." "We'll be putting the same amount of starter by each row as before," explains Del, "we'll just be dividing the fertilizer up on each side. That way we hope to get better utilization of our starter." The Unger's concern about utilization came after seeing root digs. "We noticed root growth on the side where starter was applied is always significantly greater," says Del. "We've talked with guys who've gone to applying starter on both sides of the corn row, and they tell us they're seeing a five to six bushel per acre bump in yields from doing it. We're going to try it." That's "try it" but not go "all in." They'll be outfitting just one of their two 30-inch row corn planters with 2-by-2 applicators for "both sides of the row" application. "Having one planter with, and one without, the dual 2-by-2 applicators will allow us to run side-by-side comparisons in 2018," says Lance. All corn is planted strip-till. Aside from the starter application test, the Ungers aren't planning any other changes to their corn fertility plan. The fact that they own their own variable-rate dry spreader makes it convenient for them to spoon-feed their crops. Their corn fertility program includes an early spring anhydrous ammonia application, a variable-rate application of potash at-plant, starter fertilizer, and an in-season flat application of 150 pounds per acre DAP (diammonium phosphate) and 50 pounds per acre of K-MAG (potassium magnesium sulfate). They then make a final side-dress application of 32% liquid N around the V6 stage. "In total we're pushing 240 to 250 pounds per acre of nitrogen," says Del. Is there an advantage applying DAP and K-MAG on corn in-season? "We saw a bump of around 5 to 6 bushels per acre from the in-season application in corn in replicated strips," says Del. The Ungers have found their soils all need sulfur. "We're spending $20 to $25 per acre on sulfur for corn, but our experience is we can't move nitrogen in our soils without sulfur," says Del. "A lot of times when you see yellow corn, the nitrogen is there–it's just short of sulfur, which is very leachable." NITROGEN AND SULFUR FOR SOYBEANS. The Ungers' 2017 soybean yields were at their three-year average of 67 bushels per acre, but not as good as they've seen in recent years. The unusually dry August was a drag on yields. However, Del and Lance are eager to see if applying nitrogen and sulfur on soybeans will boost yields and give them a return on investment. So this year they'll be field testing applications of potash and K-MAG together, potash and AMS together, and K-MAG and AMS. "In 2017 we only applied potash and K-MAG dry fertilizer in-season on our non-irrigated soybeans," says Lance. "With these tests we're trying to see if applying nitrogen and other nutrients could push soybean yields higher on our sandier soils." The Ungers irrigate 35% of their corn/soybean acres. They're planning to test an application of nitrogen on some irrigated soybean acres at around R4. That application will be made through the pivot system. "Irrigated soybeans typically yield in the high 70s and low 80s bushels per acre," says Lance. "This test will help Del and Lance see if they can get a return on investment from nitrogen, especially on low-organic soils," says Burk. The Ungers used a soybean seeding rate of 145,000 per acre in 2017. Seeing some reduced stands yielding well last year, they'll be reducing the seeding rate to 135,000 across all acres. However, they'll run strip tests on a 130-acre, non-irrigated field to compare 135,000 seeds per acre against 100,000, 120,000 and 140,000. "We're hoping that test will tell us if lowering seeding rate to 135,000 was enough–or if not what the optimum seeding rate is," says Lance. Soybeans will be planted with a 36-row planter with 20-inch row spacing. "With our program of in-season fertilizer application we went with 20-inch wide rows over 15 to get away from having to drive over our beans during fertilizer application," says Lance. Waterhemp and marestail are the Ungers biggest weed concerns. Last crop year they applied Zidua PRO herbicide preplant and came back with glyphosate postemergence on their early planted soybeans. For later-planted beans they used a dicamba-tolerant variety giving them the option to post-apply Engenia herbicide, Zidua PRO and glyphosate. "Zidua PRO gives excellent residual control of waterhemp," says Del. "But last year, after we put Zidua PRO down rains kept us out of the fields for 4 to 5 weeks–delaying both soybean canopy and postemergence applications." Where they planted dicamba-tolerant soybeans, the Engenia dicamba gave excellent control of waterhemp. For 2018 they'll be able to use dicamba on all soybean acres. Whether it's finding the best micronutrient pack or where to place starter fertilizer, the Ungers are more focused on increasing yields than on reducing input costs. "We feel if you're going to come out of the back side of this economic situation, our philosophy is you've got to concentrate on the production side and 'bushel your way' out of it," says Del. "Raising yield is another way to lower cost per bushel and break even," notes Lance.